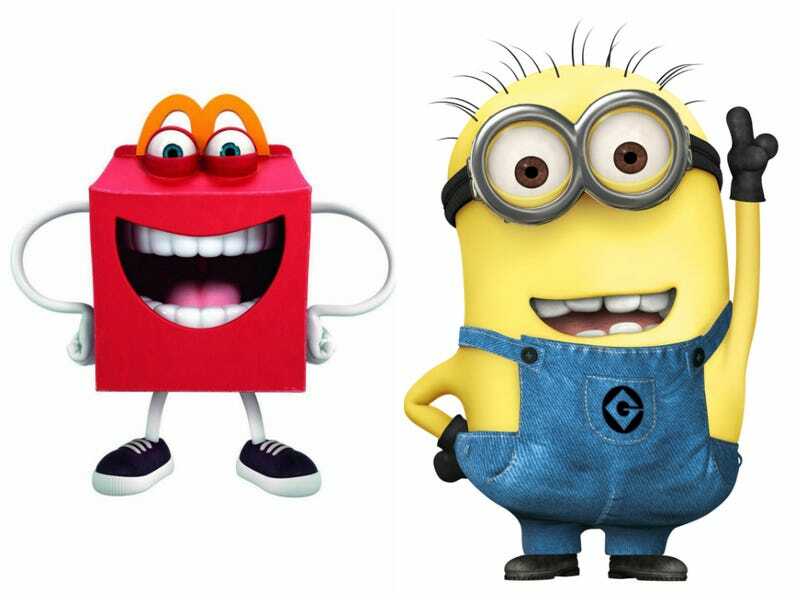 Is the New McDonald's Mascot Really Just a Despicable Me Minion? Happy is the mascot for McDonald's happy meals in France and Latin America, and he's coming to the United States now. And much like Despicable Me's Minions, he has bulging eyes, big ol' teeth, and some rubbery arms. On top of that, watching Happy in action is like watching any of the minion mini-movies used to advertise the film. Check it out yourself. The similarities don't end there, either — and that's because the same team made both Happy and the Minions. Mac Guff, the French studio that animated Despicable Me, must have run out of ideas. That, or McDonald's demanded an almost identical mascot due to the minion's popularity. While it's not immediately apparent, both McDonald's and Mac Guff acknowledge the similarity and let the two team up for a TV spot. The next logical step is completely replacing minions in Despicable Me 3 so that the whole movie is product placement.